MANILA, Philippines (Released) – The June 2018 Agriculture board exam results or the Agriculturist Licensure Exam including the list of passers, top 10 examinees, performance of schools, among other important announcements are available at this website as the Professional Regulation Commission (PRC) releases the results online five (5) working days after the last day of board examination. As announced, 1,689 out of 4,428 examinees successfully passed the exams. 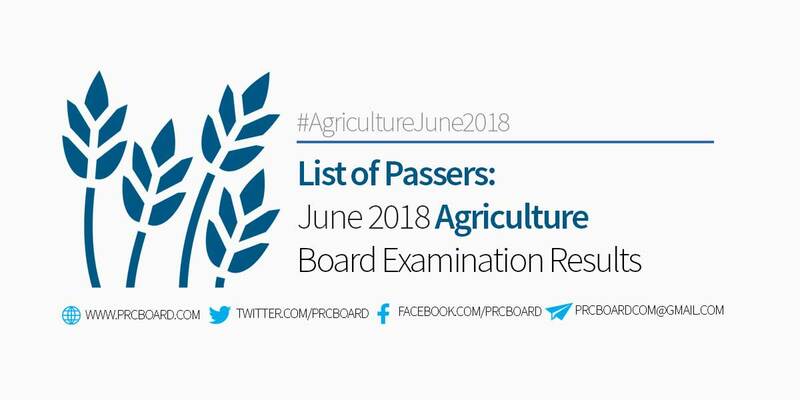 The June 2018 Agriculturist board exams are administered by PRC Board of Agriculture headed by its Chairman, Dr. Fortunato A. Battad and its members, Dr. Nora B. Inciong, Inv. Gonzalo O. Catan, Jr. and Mr. Vicente L. Domingo on June 24-26, 2018 at PRC testing centers in Manila, Baguio, Cagayan De Oro, Cebu, Davao, Iloilo, Legazpi, Lucena, Pagadian, Tacloban, Tuguegarao and Zamboanga. As per PRC Resolution No. 2017-1068 series of 2017 or the “Schedule of Licensure Examination for Year 2018”, the target release date of June 2018 Agriculture board exam result will be in five (5) working days after the last day of board examinations or by Tuesday, July 3, 2018. On the most recent exams conducted November 2017, results were out after five (5) working days. During April 2017, results were released after four (4) working days while on October 2016, results were out in five (5) working days. The schedule of online appointment for issuance of Professional ID and Certificate of Registration will be from July 12 to July 13, 2018. PRC is strictly implementing the online registration system for all passers effective March 30, 2016. Initial registrants are advised to register online via http://online1.prc.gov.ph, an online application and registration portal of PRC. On the most recent exams conducted by PRC on November 2017, 2,883 out of 7,537 examinees passed. Neil Pep Dave Nellas Sumaya from University of Southern Mindanao - Kabacan ranked first in the exams garnering 87.83% rating followed by Gay Martinez Francia from Southern Luzon State University - Lucban (SPLC) having 87.17%. In the top performing schools, University of the Philippines - Los Baños was the lone school in the list having 128 out of 129 examinees passed or 99.22% overall passing rate. During the exams conducted April 2017, 927 out of 2,938 examinees successfully passed. Merie Joei Nable Magno from Central Luzon State University topped the exams garnering 86.17% rating followed by Richie Daliva Miguel from Mindanao State University in General Santos City having 86.00%. To receive up-to-date news on Agriculture Board Exam result 2018, we advise our visitors to bookmark this page, visit PRC official website, follow us at our social media pages via Facebook and Twitter or join the members discussions at our Facebook Group. Were waiting for board exam result! board exam result please..nakulban na ni take. Gosh... Can't wait for the result..
ANO PO ORAS IRERELEASE ANG RESULT ? Mas ako pay grabe ka excited sa result bisan di ako ang nag take. result of latest agriculturist please. . .
panu po pag na late pwede pa po ba mag habol?